Bees are an essential part of the ecosystem. Bees are the primary pollinators that help the plants to grow fruit and vegetables. In recent years there have been reports of bees dropping off in large numbers. Hives are not surviving the winter and the number of bees overall has dropped significantly. USA Today reported that a third of the bees in the United States died in 2016. This is causing worry about how it will affect the food supply overall. It is important to be proactive and to protect bees from the issues that may be threatening them. Bees are disappearing for a number of different reasons. There are diseases and parasites that target bees and once infected an entire colony can die off. Bees are also struggling with poor nutrition. Bees do not do as well when they only have one type of pollen to feed on. Just like people they need more variety in their diets. Another big issue are the use of pesticides and insecticides in fields, gardens and around homes. These are often toxic and will impact honeybees in the same way they would other insects. The decline in bees is happening all around the world. Are Organic Pesticides Safer for Bees? Organic pesticides can be safer than other pesticides. Not all pesticides are considered safe for bees. 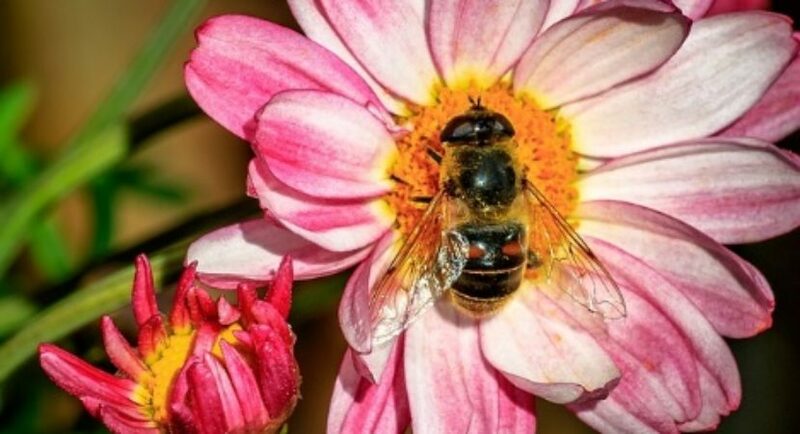 It is important to do careful research to find the perfect balance to treat the insects that are plaguing your garden and home while still protecting the bees. You will need to look at the type of pesticides that you are using to try to protect bees. There are keywords that you need to look for that indicate whether or not they will affect the bees. Pesticides that contain neonicotinoids are particularly harmful. These pesticides will not only affect the bees when they land on treated plants, but they settle into the soil and then the plants absorb them and that can negatively impact the bees. Pesticides that use the word systemic tend to settle into the soil and can cause issues months after the initial application. Some organic pesticides are safer for bees. It is important to do your research to make sure the options that you are using the products that are safer for bees. Pyrethrin is a safer product that is made from chrysanthemum oils. It is safest when applied when applied during dawn or dusk. Neem oil is a safe option when applied in the right dosage. It needs to be diluted so that it is no more than three percent of the solution. Epsom salts are good at eliminating pests that may be attacking your plants. You can apply the Epsom salts to the ground around the plants. This serves as a good fertilizer for your plants and can eliminate slugs and other bugs that may try eating the plants in your garden. When using organic insecticides, there are steps that you can take to protect bees. While some treatments are safe for bees, they can still cause issues if they are not applied correctly. Mixing the pesticides, yourself may also cause issues because if the concentration is too high then it can negatively impact the bees. Following these guidelines can reduce the amount that they affect bees. Apply Organic Insecticides at Dawn and Dusk—Bees are most active during the day. They are also affected by pesticides that are airborne. When the bees fly through the insecticide, they will absorb it through their exoskeleton. Applying the treatment when bees are not active can reduce the exposure. Do Not Treat Flowering Plants—It is best to avoid treating plants that bees will land on. Even when using organic pesticides, you should avoid applying the treatment directly to flowering plants. Treat in a wide border around areas that have flowering plants or your garden. Be Aware of Drift—Drift happens when the wind blows during an application. You should be aware of the drift that is happening when you are applying the treatments. Avoid applying treatments on windy days. Hire a Professional—Professional are trained in proper application and to help protect the bees in the area. If you are worried that you may accidentally harms the bees in your yard or garden, you can hire a professional that has access to a wider variety of treatment options and can apply the treatment safely. Are There Other Things I Can Do to Protect Bees? One thing to consider is the soil and plants that you are adding to your garden. Many people just assume that the plants they bring home from a gardening center will be bee friendly, but if they plants were treated with insecticide that is toxic to bees, and you plant it in your garden, you can negatively impact the bees around your home. Be sure to research the treatment method for plants that you purchase. You should check your soil or the compost that you buy to make sure that pesticides are not added to the soil. Buying pesticide free soil adds another layer of protection to your home. You can reduce the amount of treatments that you need to do by keeping your lawn and garden trimmed short. This gives other insects fewer places to land and breed, which may mean that you need to treat less often or that you do not need to treat in areas around your garden or flowering plants. If you are worried about mosquitoes, addressing standing water can reduce the number of mosquitoes. Using bug traps and removing the insects by hand can reduce the amount of pesticide that you need to use around and on the flowering plants. This is a good solution for a vegetable garden and can be done when you are weeding anyway. Another option is to introduce insects that are beneficial to plants like lady bugs that will attack the bugs that may be eating your plants. Miriam Caldwell graduated from Brigham Young University with a degree in English. She has been working as a freelance writer since 2005 and has written on a wide variety of topics ranging from personal finances, home care, parenting, WordPress, gardening to pest control. She also teaches writing and enjoys helping others learn something new.